Among the various solar products out there today, whether it’s solar garden lights or solar panels for your home, the solar cell phone charger – or as I call it “Portable Solar Power” – is the new trend; with billions of people using cell phones around the world, why not harness the power of the sun for the benefit of the world in which we live in. In our solar cell phone charger series we will take a look at some of today’s solar phone chargers leading brands – get it while it’s hot! The stylish powermonkey-eXplorer solar charger lets you charge wherever, whenever, providing you with power even in the most remote locations. Compatible with the majority of mobile phones and other portable devices, this solar charger will recharge your devices, giving you 96 hours of standby on your mobile, 40 hours on your iPod, 5 hours on your games console, 48 hours on your PDA and 6 hours on MP3/MP4 players. The powermonkey-eXplorer solar charger comes in a water resistant, colorful rubberised casing; it’s Ultra compact, tough and powerful, featuring an LCD screen that displays battery capacity and the level of charge. 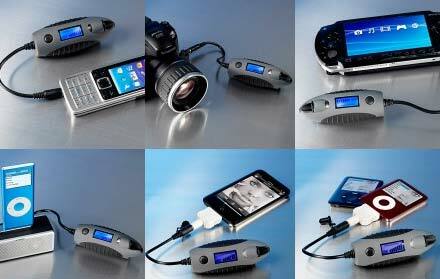 It also has short-circuit protection, over-charging protection and over-discharging protection. The included mains charger has interchangeable heads for UK, Europe, US and Australia – so you can use it in over 150 countries around the world! This ultra-portable solar power device with Built-in cell-phone charger is ideal for hiking, camping or any other outdoors activity. It can also be an excellent addition to any emergency-preparedness kit. To generate power all you need to do is turn the hand crank or capture the sunâ€™s energy and run it on solar power – No plugs or wires required. Youâ€™ll always know whatâ€™s going on, thanks to the AM, FM, and weather bands. You can also tune in to the FCC and EAS public alert systems. 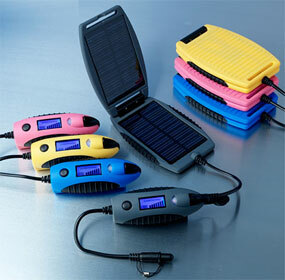 Add the flashlight, the cell phone charger and youâ€™ve got one versatile portable solar power device. While everybody wants to stay connected and entertained while we’re on the go, it is only natural for us to use alternative sources of energy in order to charge our cell phones and other portable personal devices – check out more reviews from our Solar Cell Phone Charger series.